Flagman Hotel in Sozopol beach resort on the Black Sea in Bulgaria. 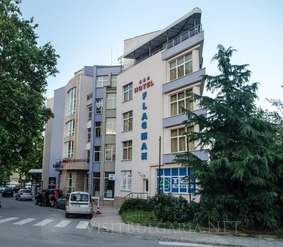 Location: Flagman Hotel is situated just 50 m away from the "Hramanite" beach in Sozopol sea resort in Bulgaria. Accommodation: The hotel offers 41 double rooms, 4 studios, 3 1-bedroom apartments and 4 2-bedroom apartments. All rooms and apartments feature balcony with sea view, TV, telephone, mini-bar, air-conditioner, bathroom with a shower and hair-drier. Wine & Dine: Restaurant Flagman offers Bulgarian and European cuisine and a wide range of alcohol drinks and cocktails. The indoor hall of the restaurant has a capacity of 100 seats and the 2 outdoor verandas - 160 seats. Entertainment: Flagman hotel offers excellent swimming pool with separate corner for kids. Guests of the hotel can use a modern sports centre with fitness hall in the hotel. Sauna, Jacuzzi and massage halls are also available. Hotel facilities: 2 lifts, currency exchange office, outdoor swimming pool with cafe, barbeque, fitness hall, children play ground. Meetings and events: The hotel offers excellent conditions for holding meetings and company events for up to 100 guests. The conference hall offers all modern technical equipment and is fully air-conditioned.